Can Your Landscape Support Breeding Butterflies? Adult butterflies are pretty easy to attract to your landscape if you provide flowering plants, but getting them to lay eggs in your garden is a little trickier. Butterflies go through complete metamorphosis which means that they have four main life stages. The first is the egg, second they hatch into caterpillars (larvae) which feed and molt many times, the third stage is the pupa or chrysalis, and finally they emerge as colorful adults. Complete metamorphosis is considered a more advanced life cycle than incomplete and one of the reasons is because most insects that go through this process do not compete for food at different life cycles. 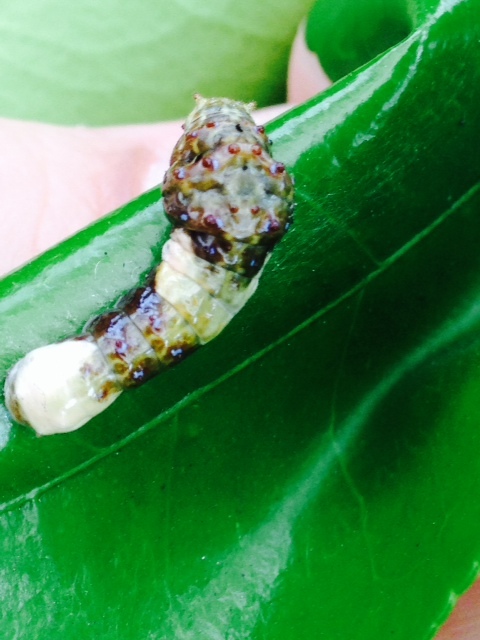 For example, the gulf fritillary butterfly larvae needs passionflower (Passiflora spp.) to feed on – no other plant type will do. The adults visit many flowering landscape plants such as zinnias, butterfly bush, pentas, etc. The adults are feeding on nectar while the caterpillars are eating foliage. Because the larvae are very host specific, you must offer the correct plant to attract particular butterflies. Luckily, we have many options in the Florida panhandle! Just remember if you would like to attract butterfly breeding to your yard, you must sacrifice some foliage to support the caterpillars. If you would like to know more about individual butterfly species please visit UF/IFAS Entomology & Nematology’s Featured Creatures website. Many of us enhance our home landscaping with bird feeders, bird houses, bird baths and other items so that we can attract wildlife. 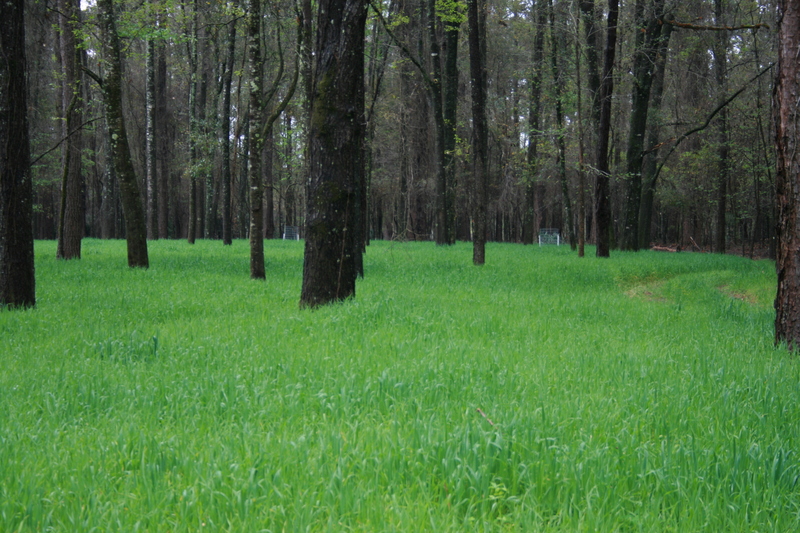 To accomplish the same thing, many rural landowners plant wildlife food plots. While large landowners often plant several acres, food plots can work well in any sunny area and can be as small as an urban garden. Food plot plants that do well in our area include clovers, millet, partridge pea, winter wheat, corn, sunflowers and legumes. Deer also like beggerweed and cowpeas. If you decide to establish a wildlife food plot, you should manage it just like any other garden. The location should be sunny (a minimum of 50% sunshine is recommended) and plots often look better and wildlife will feel safer if you have a backdrop like a forest edge or tall hedgerow. Just like any other garden, turn the soil with a garden plow or shovel and than smooth the seedbed. Seeding can be done by hand or with a handheld broadcast spreader. Seeds should be covered lightly (1/4 to 1/2 inch in most cases) and watered as needed. In normal years watering won’t be needed, but if you get an extended dry spell you may want to give the plants additional water. Fertilizer is also recommended and will definitely give you more productivity. I have escaped that myself by growing clover in the winter for nitrogen and adding fireplace ashes to provide calcium (liming agent), potassium and phosphorus. If there is any doubt about what to apply, it is best to get a soil test and follow the recommendations for applying lime and fertilizer. Contact your local County Extension Office for more information. I generally plant two crops in my wildlife garden–crimson clover in October (that beautiful clover you see in spring along the highways) and brown top millet in the spring after the clover dies back. I mow between seedings; this can work without tilling with some crops, if you keep the weeds under control. When I mow the millet it puts the seed on the ground and many ground feeding birds like doves move in to eat the seeds. Speaking of gardens, the wildlife food plot makes a useful cover crop for your vegetable garden if you are taking a long vacation or just need a break for any other reason. You can also use the plants as green manure when you decide to put vegetables back in your garden. It is always good to remember that when wildlife view your landscape, they don’t see pretty grass, flowers, shrubs and trees–they see habitat, good or bad. 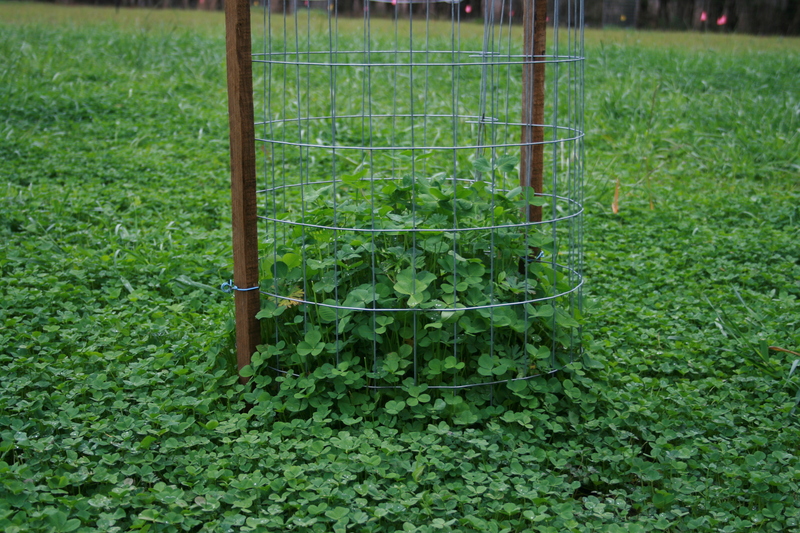 Food plots simply boil down to food and shelter for them. To learn more about food for wildlife, consult this article on establishing and maintaining wildlife food sources. The University of Florida/IFAS presents Art & Garden Fall Family Festival, October 3, at the North Florida Research and Education Center (NFREC), Quincy Campus. Join us that day and discover creative ways to explore visual art and the art of gardening through demonstrations and fun activities for the whole family. Speak with experts about all your gardening questions or purchase unusual, hard-to-find, top-performing plants for our area. Take a tour of the Gardens or a trolley ride highlighting fruits and nuts that can be grown in our area. Locally grown produce and garden plants as well as arts and crafts will be for sale along with food and refreshments. Children’s arts and crafts activities will take place in a huge “Kid Zone” located in a shaded, garden area. The Art & Garden Fall Festival is free and open to the public from 9 a.m. to 2 p.m. on Saturday, October 3. The festival takes place in Gardens of the Big Bend, located in Quincy at I-10 Exit 181, just 1/8 mile north on Pat Thomas Highway (SR 267). The Gardens are located on the campus of University of Florida/IFAS, North Florida Research and Education Center, off Pat Thomas Parkway, SR 267 at 155 Research Road, Quincy, FL. Located just north of I-10 Exit 181, 3 miles south of Quincy. 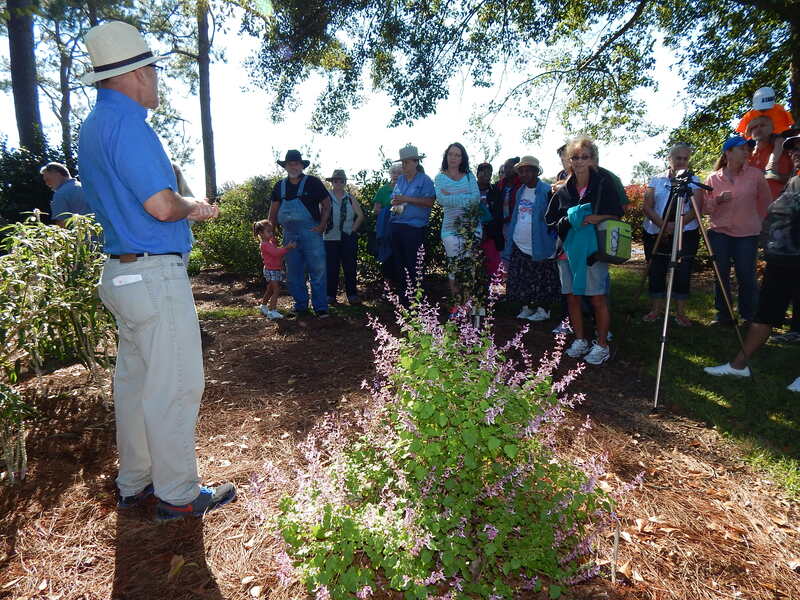 Presented by the University of Florida/IFAS, North Florida Research and Education Center in collaboration with the Gadsden Arts Center, Gardening Friends of the Big Bend, the Quincy Garden Club and other area garden and arts organizations. For more information: http://nfrec.ifas.ufl.edu/art-and-garden/ or 850-875-7100. 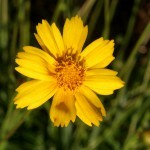 Native Lanceleaf Coreopsis. UF/IFAS Photo: Thomas Wright. 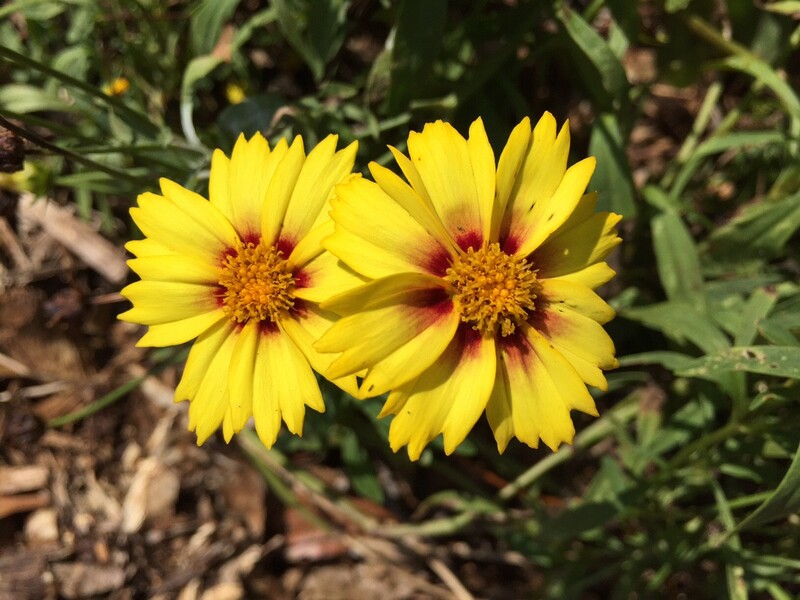 In our demonstration garden we are enjoying the small but vibrant blooms of our state wildflower Coreopsis, also commonly known as tickseed. 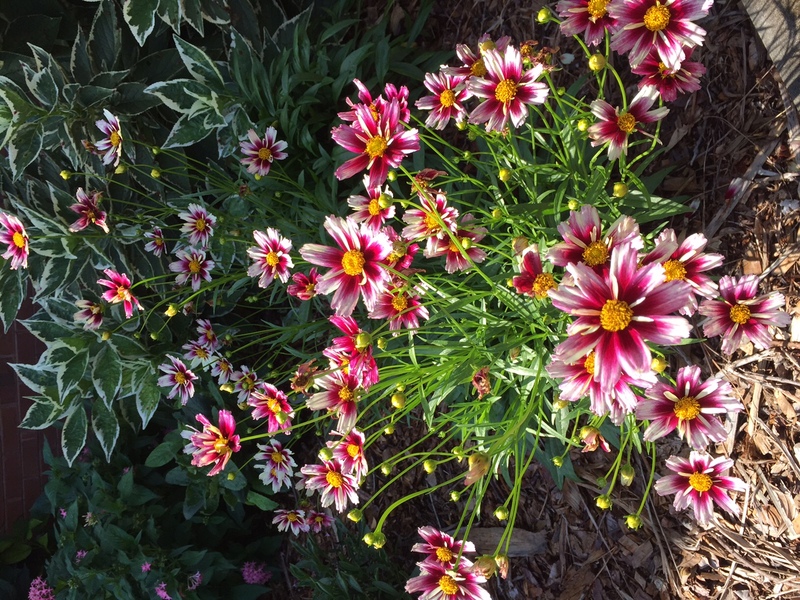 After many years of its use in the Florida highways beautification program, Coreopsis was adopted as Florida’s official state wildflower in 1991. 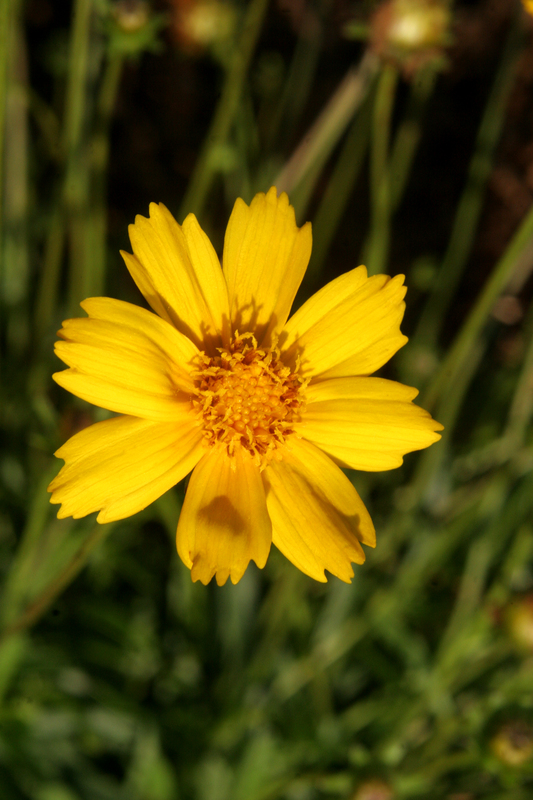 Florida can boast of 16 different species of Coreopsis that occur in the state with most blooming in the spring but some species blooming in the summer to later in the fall. Some of those species are rare, endangered or only found in very limited areas of the state, while others are quite common throughout the state. Photo credit: Mary Derrick, UF/IFAS. Many lovely new cultivars have been introduced for our enjoyment by plant breeders through cross-breeding and selection. Some you can see in the accompanying photographs in this article. 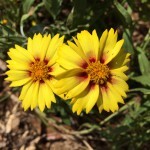 Coreopsis is an annual or short-lived perennial that makes a great addition to your garden beds. And the bees and butterflies will enjoy them! The numerous flowers readily produce seed for naturalizing in the landscape. 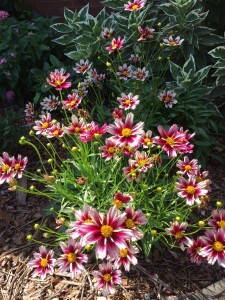 Plant them in a sunny spot in the landscape in evenly watered but well-drained soil. Removing the dead blooms will encourage plants to prolong their blooming; you can also save the seed for replanting in new areas of your landscape. As September rolls into October and we finally experience cooler temperatures, I always look forward to seeing one of my favorite native grasses in full bloom. 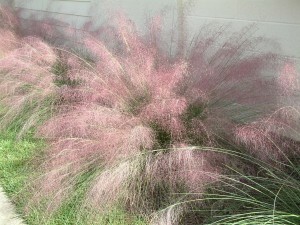 Muhlenbergia capillaris, or Muhly grass, is an extremely versatile plant in the home landscape. It is both flood and drought tolerant and easy to maintain. A true local, it is typically found growing in beach dune areas, sandhills, pine flatwoods or coastal uplands. It provides nesting material and shelter for birds and small animals, and is known to attract beneficial ladybugs. Muhly grass grows in a clumping form, usually 2-3 feet in height and width, and looks great in clusters as a border along the edge of a building or lawn. It can also be used as an eye-catching centerpiece in a landscape. The plant’s most notable feature, however, appears in late September and early October. This is when hundreds of filamentous blossoms form a dramatic display of deep pinkish purple. When the wind blows the colorful blooms, it creates an appearance of a pink cloud hovering over the grass. Muhly grass is semi-evergreen, turning more copper in color as it gets colder. The only maintenance needed is voluntary; in late winter it can be trimmed down to 6-8″ to remove older, dead blades before the growing season. This plant was chosen as the 2012 Plant of the Year by the Garden Club of America, and is a great selection for our area. For more information on the plant, please visit UF IFAS “Gardening Solutions” or speak to your local UF IFAS Extension horticulture agent.